More than 100,000 'different' stamps have been listed by experts, but only about 50,000 of them have different designs. On at least 10,000 there are pictures which may be used for language purposes, and this book gives a selection of more than 800 such pictures which may be a help in learning the senses of the 850 words of Basic English. Some of them are grouped under such words as animal, language, science, and writing, to make the learning of Basic as interetsing as possible. We were not hoping to get a picture for every word ; this will be done in other picture books.1 The idea was to see how much the stamps, which for other reason, now have an international distribution among young, and old, would be able to do for the system--and at the same time to make the science and art of Philately2 of more value in education. Those who are not in touch with the dvelopment of Philately will probably have little idea of the range of interests covered. Kings and Presidents are among the experts whose names are o the lips of every schoolboy. The fact that millions of boys and girls ahve been putting their pcket-money into these little bits of paper for more than fifty years, and get fromt hem their first knowledge of history and geography, gives us a good start. No one will be able to say that the experience of teachers, which so frequently gives the death-blow to new ideas, is against the use of designs less than an inch square, because of some theory about eye adjustments in ten-year-olds. It may not be common knowledge that in Costa Rica newspapers and advertisement material go post free, but long before San Jose is even a name on the map, the faces and pictures onthe stamps of Costa Rica are old friends in teh houses of the European poor, who get them and the books in whch they may be fixed, from any cut-price store. In addition, the pictures in question, from Costa Rica and Dahomey, from Ecuador and Finland, from Guatemala and Haiti, are generally well designed--much better than any of the pictures in language books for schools. They are works of art, representative of important events in the history of nations; the governments, such as they are, do their best to keep them up to a level of current taste at which there will be no outcry from any important group ; and it is strange that they have never been given attention by those who make the teaching of language their business. 1. Basic Motion Pictures (1937) and Basic by Isotype (1937) were the first steps ; and later, some of the stamps may take their place in Basic by Pictures. See word pictures. 2. Philately is the strange name given to all forms of interest in stamps. It was first used by M. Herpin in Le collectionneur (1865), and the Greek words from which it is formed are loving + free of tax-- that is to say "love of everything which has to do with payents before (posting)." 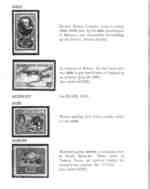 Some ten years back, while Basic was still in the early stages, it seemed to us that there might be a use for stamps among the new forms of picture-teaching which would have to be tested by the Orthological Institute. In those days the number of picture-stamps was small, and the organization of air-posts was limited to two or three countries which made little use of the special stamps now printed for long distance flights. Even so, we were able to put together more than a hundred pictures, to which additions have been made month by month. More than 800 examples, making clear the senses and uses of almost all the Basic words, have now been listed, and we have the necessary authority from the Post Office to make use of them for teaching purposes: Those who are not in touch with the science and art of Philately will probably be surprised at the range of interests covered. The marketing of stamps has become a great industry. As much as £300,000 has been given for one American group which the general public has never seen on a letter-cover; there are stamps valued at more than £10,000; and Kings and Presidents are among the experts whose names are on the lips of every schoolboy. The fact that millions of boys and girls have been putting their pocket-money into these little bits of paper for more than fifty years, and get from them their first knowledge of history and geography, gives us a good start. No one will be able to say that the experience of teachers, which so frequently gives the death-blow to new ideas, is against the use of designs less than an inch square, because of some theory about eye adjustments in ten-year-olds. It may not be common knowledge that in Costa Rica newspapers and advertisement material go post free, but long before San José is even a name on the map, the faces and pictures on the stamps of Costa Rica are old friends in the houses of the European poor, who get them and the books in which they may be fixed, from any five-and-ten-cent store. This is a hardback book about 10"x7" of about 180 pages of picture quality paper containing 4 or 5 B&W pictures of world stamps on each page with a Basic word and its use in a sentence or two.